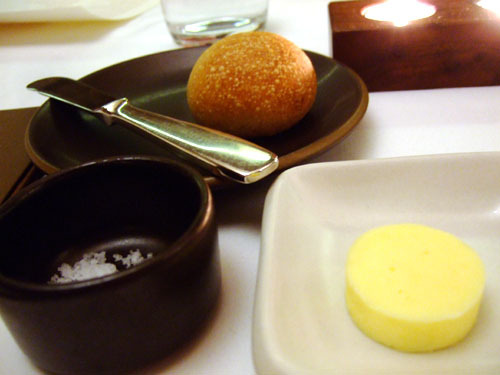 To round out the Bay Area Michelin 2-star tour my friend and I selected Manresa in Los Gatos. 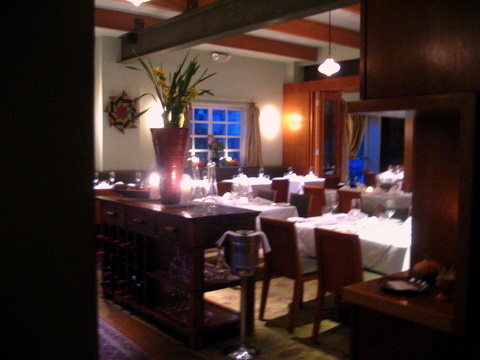 The area has a small town feel to it and the restaurant is perfectly suited to that sedate environment. From the outside the restaurant actually looks like somebody's home, complete with a quaint little sign stuck in the flower bed. The decor inside matches the exterior, with a slightly rustic feel. We were in a bit of a hurry since we had to catch a night flight out of San Francisco so we opted for a 5:30 reservation. We even called ahead and informed the restaurant we wanted the tasting menu and asked if it could be done in 2 hours. Thankfully the staff was more than willing to accommodate us. Again I decided to skip the wine and instead chose a lavender soda by a company I never heard of before. 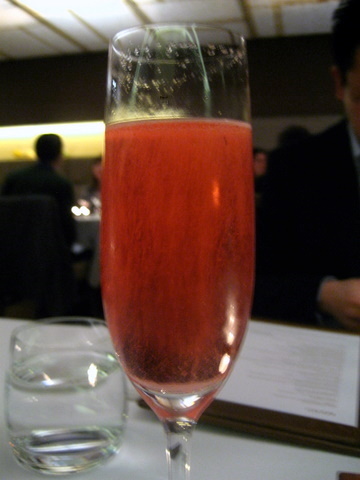 The drink was gently carbonated with a strong floral flavor and just a light sweetness. AB1: Petit Fours - "red pepper-black olive"
When this came to the table I thought, we asked for a fast dinner but we didn't expect them to start with the petit fours. The black olive madeline might be the best madeline I ever tasted, warm with a hard exterior hiding a spongy interior with a buttery sweetness shaded by a hint of olive. The red pepper gelée was definitely the far more flavorful of the pair although I found the texture a bit hard for my liking. 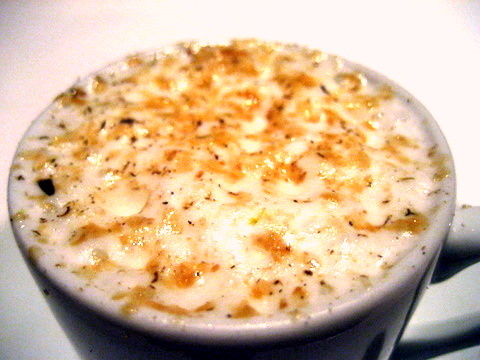 Continuing with the sweet amuses, next up was a parsnip horchata seasoned with tonka bean. The overall effect was like a spicy pumpkin milkshake with some elements of cocoa and vanilla as well. The waitress who brought these to the table warned us to eat them in one bite which lead me to expect a highly liquid center or one under pressure, in reality the center was quite thick and creamy. With foie gras and chestnut, I thought the filling would be rich and sweet but it turned out quite mild with a slight alcoholic burn. The last of the four amuses also blends savory sweet flavors together. A delicately cooked egg topped with sherry vinaigrette and maple syrup, the sweetness eventually gives way to a straightforward saltiness. 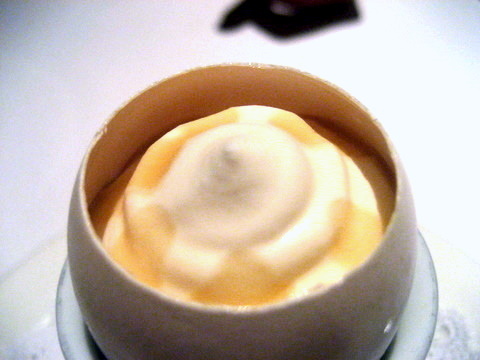 I don't think I have ever had an egg a la coque that I didn't enjoy and this was no exception. 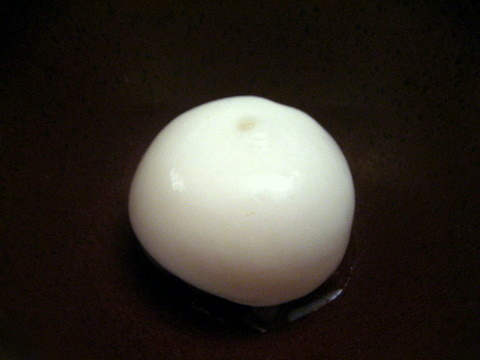 The kitchen paired tempered forms of powerful flavors with the egg which let the focus remain on the natural flavor of the egg. Levain refers to a leavening agent used in the fermentation process that results in bread with a rich aroma and pleasing texture. With its hard toasted crust and dense interior the bread was quite heavy, somehow very appropriate to the bitterness of the crust. Typically not what I look for in bread, somehow I still enjoyed this immensely. 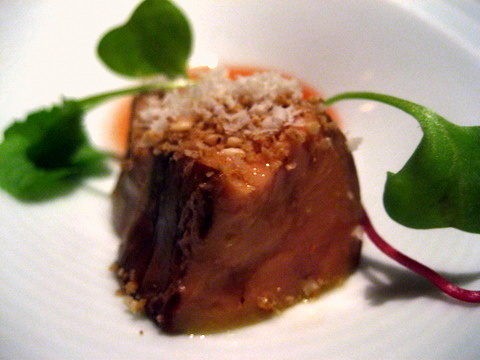 Texturally, the foie was reminiscent of a seared preparation but the smoking imparts a bitterness throughout the foie, severely muting the unctuousness of the liver. 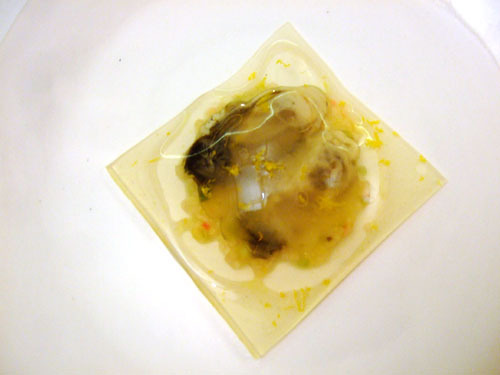 The consomme provided the perfect amount of fruit to the lighter foie. 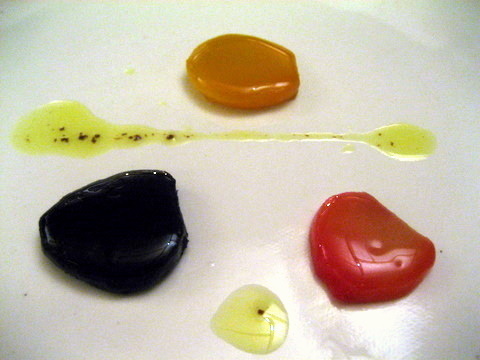 Had the kitchen used a preserve, the fruit might have dominated the dish. 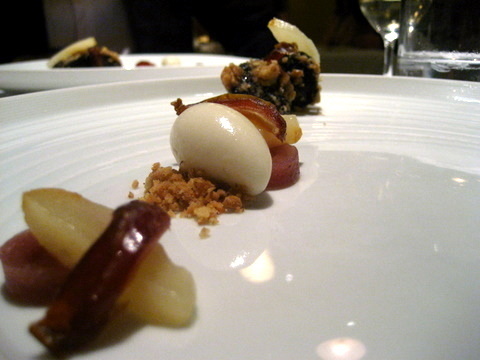 This was very similar to a course I had the previous night at Coi. 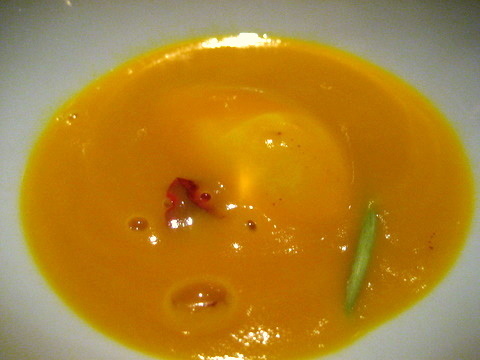 Unlike most squash soups, the soup had almost no sweetness, instead it had a neutral richness very similar to the Aperge egg earlier. 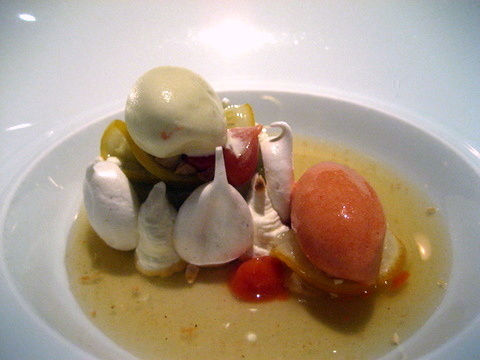 The only sweetness came from the ice cream which also added a nice chilly contrast to the soup. 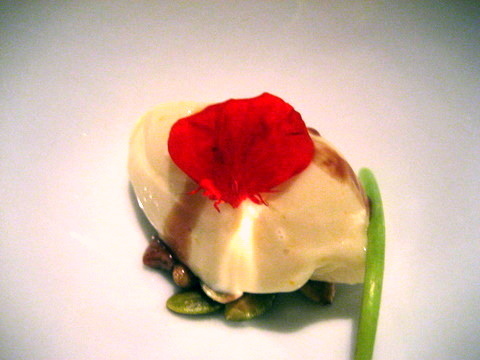 Coi also had a take on a salad dish very similar to this, trying to emulate a garden on a plate complete with a few flowers for color. This was a much lighter dish than Coi's with most of the flavors coming from the vegetables themselves. 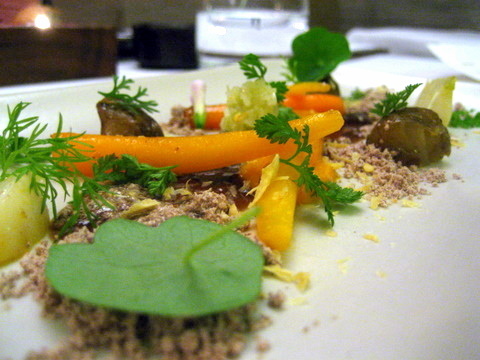 The variety of vegetables made for a complex medley of sweet and bitter flavors all flowing seamlessly from one to the next. I saw this dish on the regular menu and I was tempted to add it as a supplement. 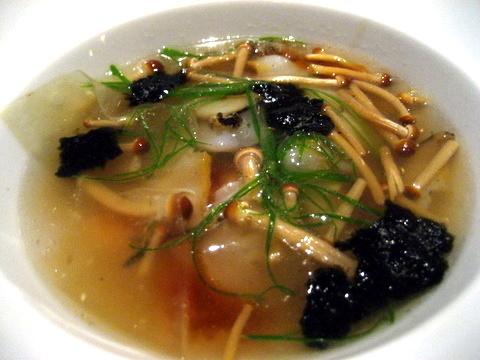 As one would expect, the complimentary flavors did very well with the dashi taking on the subtle sweetness of shellfish. The abalone was the standout of the shellfish succulent and tender the thin slices left me wanting more. The uni was a bit subdued maybe having absorbed some of the dashi it lost much of the distinctive flavor it has when served as nigiri. The mushrooms were delightful small and crunchy they released a concentrated burst of the dashi when bitten into. The foie was largely unnoticed and unneeded. 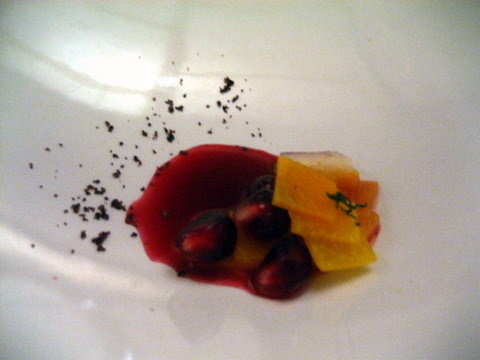 A wonderful dish overall and my favorite of the night. 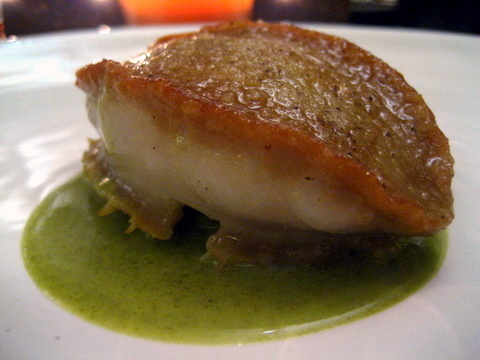 Most of my experience with black cod at restaurants is with the miso glazed preparation at Japanese restaurants. This was quite different as the fish is only lightly seasoned, overall the flavors tasted Asian-influenced likely due to the seaweed. 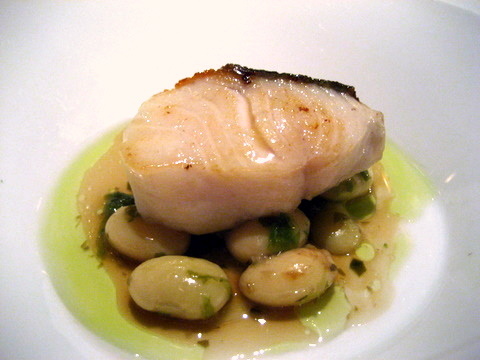 The beans were also quite effective, breaking up the oiliness of the fish with a dry gritty texture and distinctive flavor. The squab came prepared two ways, a rare roasted breast and what looks like a leg confit. 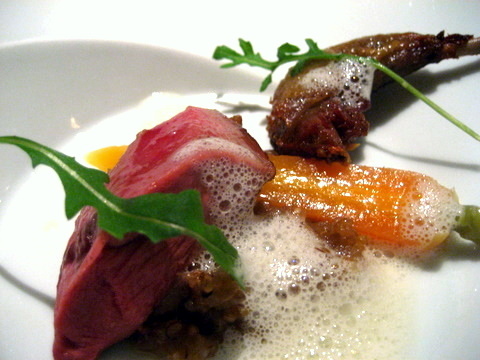 The breast meat itself was tender juicy and flavorful but still pretty prototypical for squab. The leg was nicely fried and had a salty oiliness to it, although a bit dry. In either case the accompaniments were totally unnecessary, the ground farro actually looked and felt more like couscous, and tasted a lot like stuffing. The last of the savory courses was lamb, nicely roasted allowing the flavors of the herbs to permeate the meat. There was so little gaminess that from taste alone I would have been hard pressed to identify it as lamb. We expected a palatte cleanser but they jumped into the first dessert course. There were so many flavors and textures, that it was difficult at times to tell what was going on although I did get one identifiable flavor on the finish, Fruit Loops. This reminded me of all those stereotypes of fine dining, a giant plate with a single morsel of food in the center. This time we were served three small morsels. 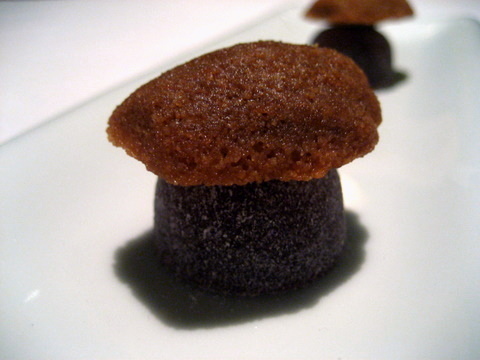 As far as spice cakes go this was fairly mild and the accouterments were natural pairings a very well designed dish. Beautiful color in this dish one of the most visually distinctive chocolate dishes I've ever seen. The only problem is the lack of balance between the chocolate and the other flavors; taken together the chocolate overpowers the rest of the dish. 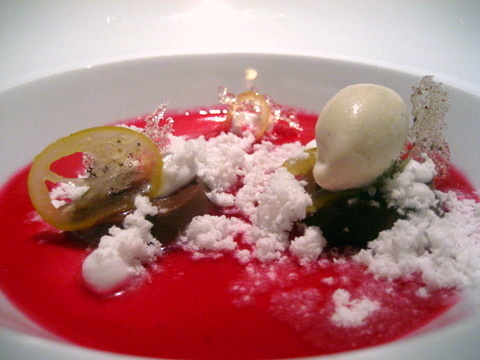 Fortunately each of the distinct elements is very strong on their own with the standout being the prickly pear soup with its distinct flavor, very floral and soothing. The chocolate is quite good, smooth and bold it lacks the complexity of the chocolate at Aqua but is still a pleasure to eat. 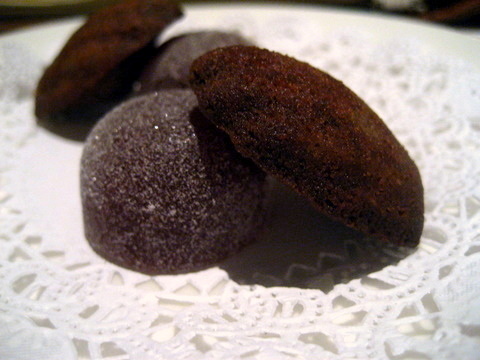 We started with petit fours, we end with petit fours. 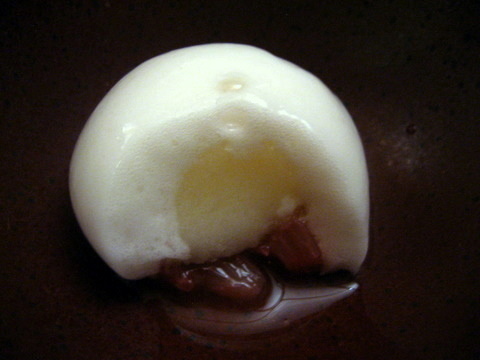 Similar to the savory petit fours, the gelée was the dominant flavor. Tasty but not as good as their savory brethren. 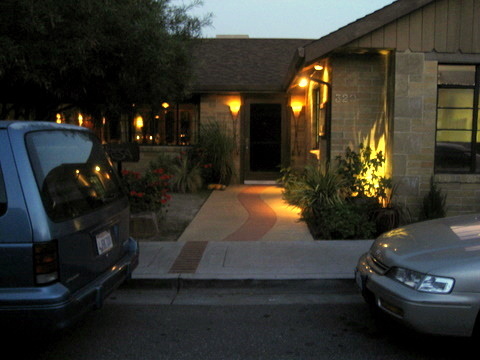 The service was very attentive to our needs, we managed to finish the entire meal and pay in just under two hours. The staff was very good about bringing the courses out promptly but leaving just enough time so we didn't feel rushed. The food at Manresa is very well prepared, the ingredients were all of the highest quality and the kitchen clearly knows what to do with it; although they don't take as many risks as Coi. Overall, a successful close to a very good weekend trip. The second stop on my 2-star tour through San Francisco. 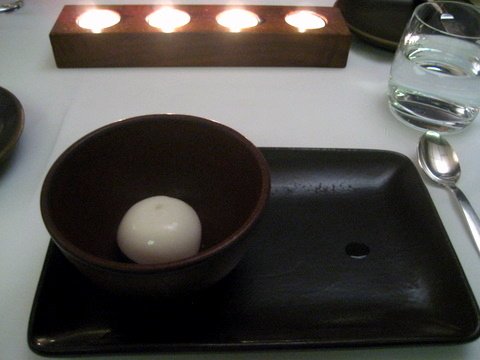 I was a bit apprehensive looking at the menu at Coi especially with regards to some of the early courses. From the exterior you'd be hard pressed to tell this was even a restaurant. 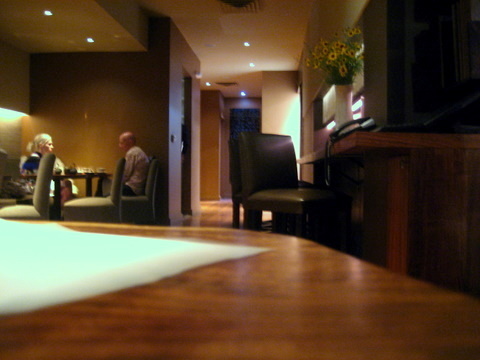 From the window, there is a view of the bar which makes the restaurant almost look like a lounge or waiting area. 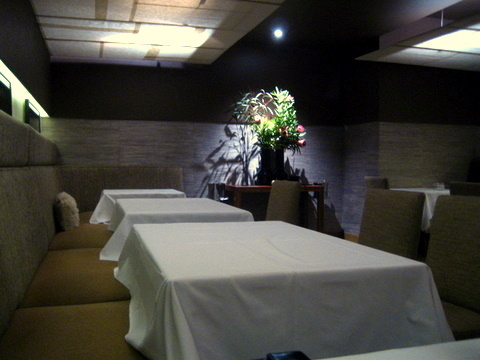 Entering the restaurant, we walked through the bar into a small windowless dining area. The rectangular room is flanked by two benches lengthwise with small tables that seated either 2 or 4 people. The whole dining area seats around 20 people and when we arrived almost all the tables were taken up by couples or pairs of couples, I had no idea the restaurant was such a hot date place. Still recovering from the debauchery that was Totoraku, I have been trying to limit my alcohol intake. I ended up splitting a couple of beers with my dining companion. He started with a Coi Aperitif rather than his traditional Mojito. The aperitif was fairly light, with no single distinguishing flavor, very refreshing. 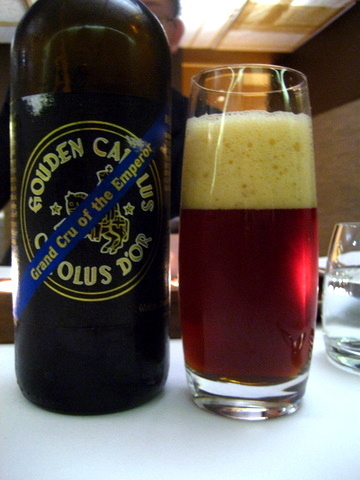 Our first beer was the 2007 Gouden 'Carlous Grand Cru of the Emperor' from Belgium. The beer had a thick head when poured and gave off an intense nose of caramelized sugar and apple cider with similar notes on the palate. 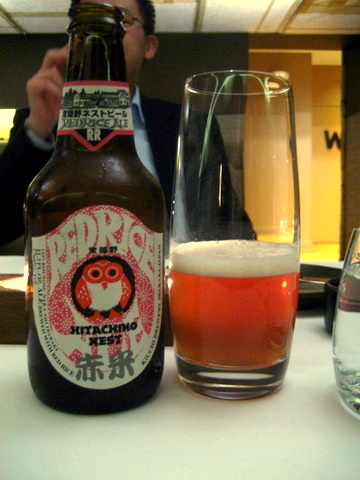 Next we tried a Kiuchi Brewery Hitachino Nest 'Red Rice' from Japan. All I could taste when drinking this was olives both the aroma and taste were dominated by loads of green olive. 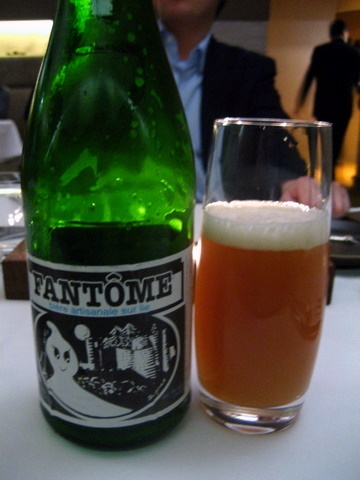 Our last beer was the Fantome Saison from Belgium. This started with a really unpleasant funk on the nose but very light grassy citrus and apple on the palate. After a while the funk dissipated and was replaced by a cidery nose. In the glass the Fantome had a cloudy haze that quickly settled to the bottom of the glass. This reminded me very much of the liquid olives and liquid cherries at Bazaar. The suspension inside the thin membrane lived up to its name. A light sprinkling of salt gave the morsel a pleasing salty finish. 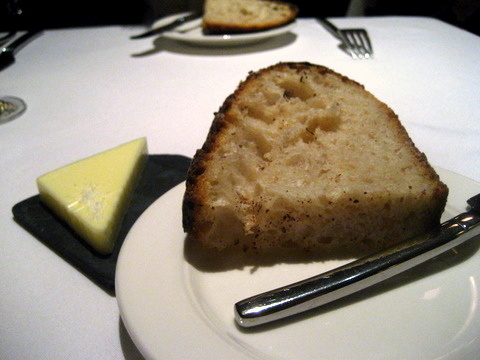 The bread was surprisingly traditional for such an adventurous restaurant, I expected a variety of bread a la Bastide. The bread was almost hot to the touch with a crunchy flaky exterior and a soft spongy interior and a yeasty nutty flavor was fairly typical of a wheat bread. My companion liked the bread so much he ended up eating 6 helpings. Visually simple the plain appearance hides a complex ballet of flavor and sensation. 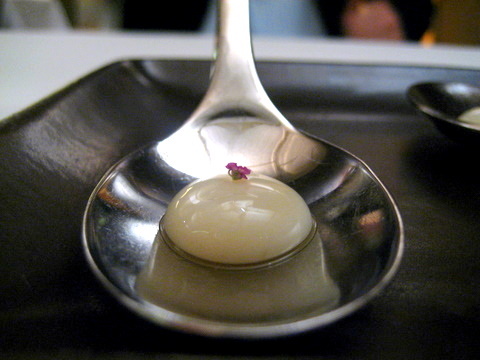 Besides the food was a dab of Coi perfume, made from the same ingredients as the dish. We were told to dab a little on our wrists as the aromas would heighten the flavor of the food. The perfume did smell strongly of citrus with some of the herbal spice from the tarragon and ginger. The white sphere is actually made up of multiple layers a foamy icy exterior wrapped around a creamier sorbet with fresh grapefruit beneath. The dominant flavor is the grapefruit although supporting hints of licorice are apparent once the initial burst of crisp fruit subsides. Never a fan of beets this was still an interesting study in the ingredient. I liked the orange the best of the three for its milder sweetness and better harmony with the vadouvan. 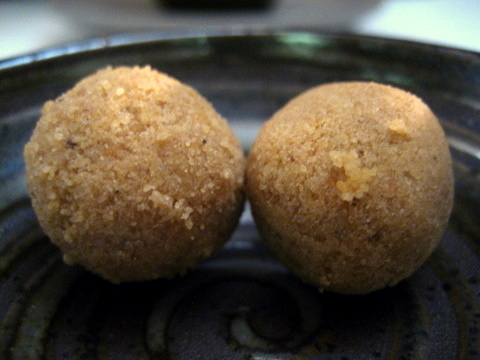 I had a dish with vadouvan the previous evening at Aqua and I felt the spice was too intense, here the vadouvan had a similar flavor but more smoothly integrated into the dish as a whole. The cheese was slightly foamy and had a very soft flavor with a good amount of creaminess nicely heightened by the olive. I particularly enjoyed the crust of the tart which was quite hard and crumbly with a butteriness. 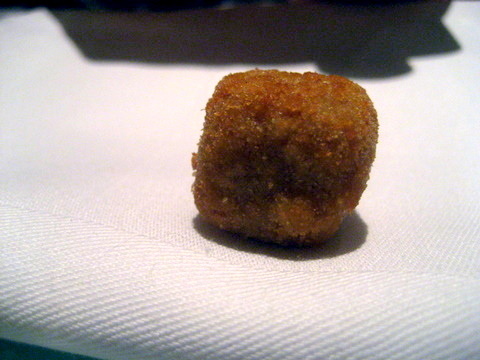 This reminded me of a dish I had at Alinea. The oysters were fresh and plump and the use of tart fruit and herbs added a zestiness reminiscent of a traditional migionette but not quite the same. 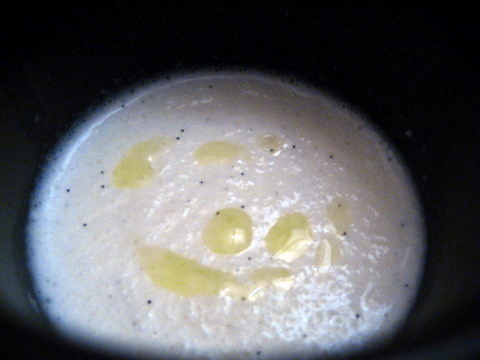 The soup was a bit too watery but it contrasted nicely with the pear and pomegranate, I thought the soup had a fairly restrained sweetness but my companion disagreed. What really impressed me about this course was the way the chile and mint further attenuated the sweetness of the dish and lingered on the tongue long after the soup was gone, leaving a tingly pleasant warmth. 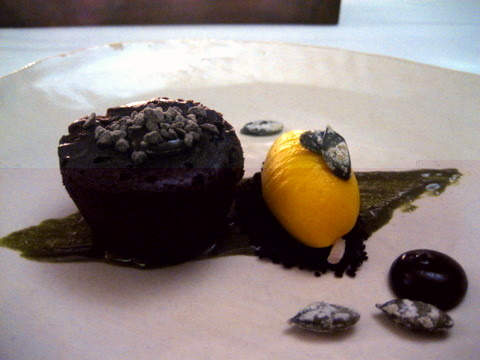 This dish indeed lived up to its name, a plate of haphazardly arranged vegetables resting in cocoa "sand". 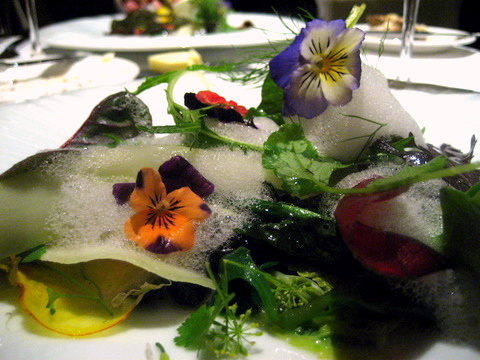 As one would expect the overall dish was quite light and refreshing with a variety of vegetal flavors and textures. Still what made this dish special was the use of cocoa which added a bittersweet earthy flavor on the finish. If parents ever have problems getting their kids to eat veggies maybe they should add some cocoa powder. 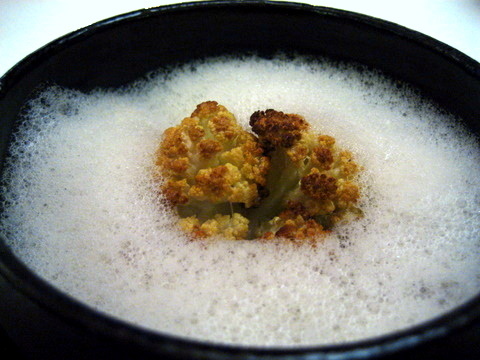 I didn't expect much out of this course but I really love what the roasting did to the cauliflower. 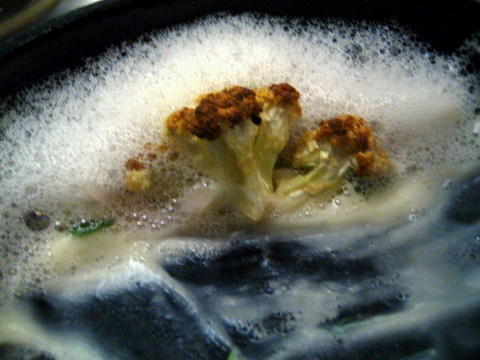 The lightly charred top had a dry bitterness that gave way to a smoky sweet flavor when taken with the bone marrow foam. The addition of intensely tart red onions kept this dish lively and vibrant. 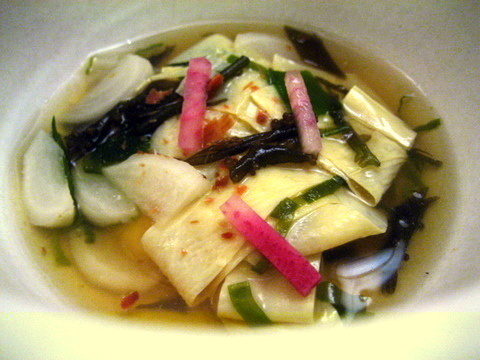 The rich mushroom dashi and seaweed actually reminded me a little of sharks fin soup. The fresh tofu was so light and airy I could barely detect it although the tofu skin had a very distinct firmness to it, like a semi-hard noodle. I was looking forward to this the moment I saw it on the menu and I was not disappointed. We were brought a whole abalone with the top nicely browned by the sauté pan. The abalone had a thick meaty texture that was a delight to chew, my friend described the texture as in the middle between sashimi and braised abalone. 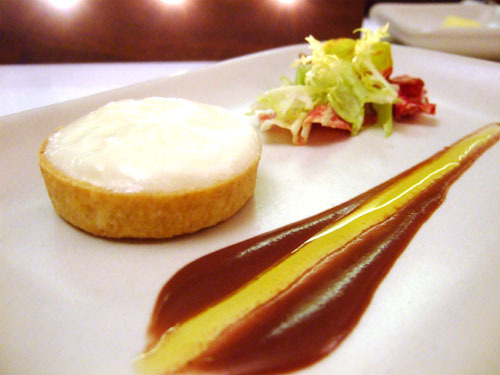 The caper lettuce sauce added a tart sauce that complimented the natural sweetness of the shellfish. After yesterday's disappointing Matsutake dish I really needed this to be better and it was. The grilled mushroom had sharp rough crunch and grilling seemed to deepen the natural woodiness of the mushroom. A light sprinkling of black pepper gave the dish a bit of bite. 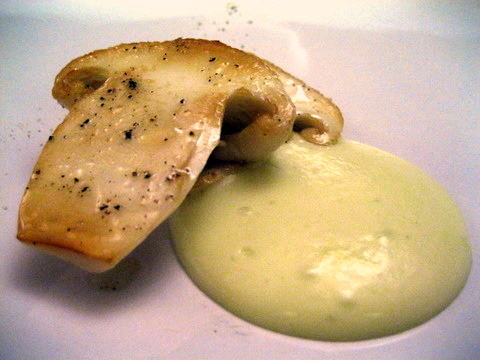 The potato pine needle puree was interesting but I thought the mushroom needed no extra seasoning. I was a bit unlucky as I ended up eating this dish second and that gave time for the egg yolk to congeal into a gel like mass. The farro was one of the strongest I have ever had, just ever so slightly firmer than a risotto, the use of Parmasean was a masterful foil for the brown butter. 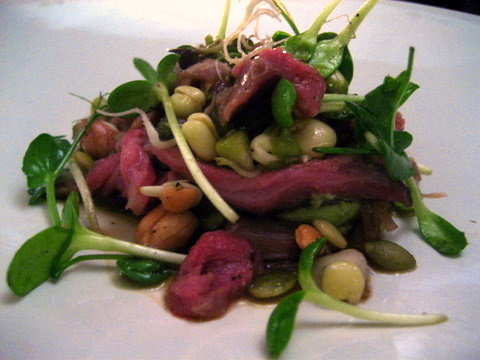 This dish had a wildness about it, the raw sprouts and crunchy nuts heightened the natural savoriness of the goat. I expected loads of gaminess but the meat was fairly mild. 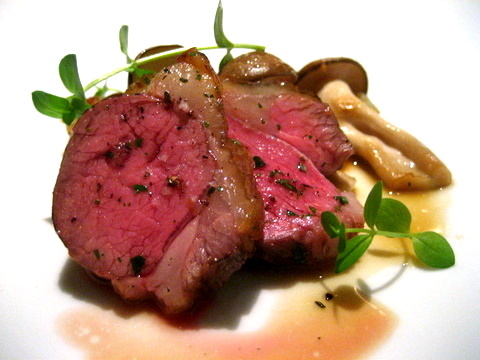 With two different preparations of goat, one braised, the other seared rare, each with their own flavor and texture. 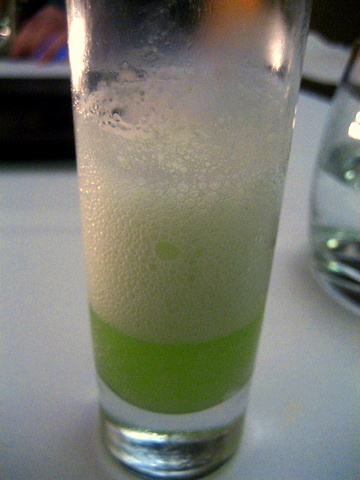 The wheatgrass puree was largely unnecessary but didn't detract from the dish either. 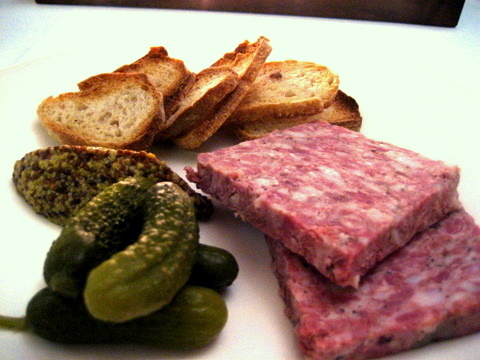 Being pork, the pate felt like it was made up of distinct bits of meat. Although I prefer a smoother texture on my pate the flavor was still quite good especially when taken with the tart mustard. 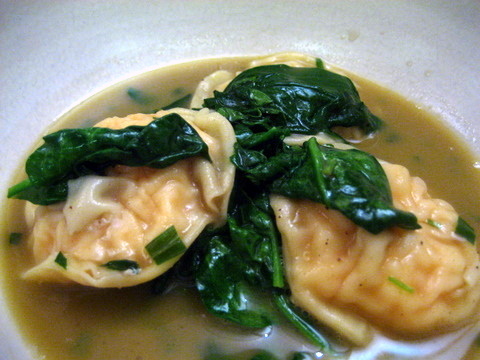 These reminded me of wontons, unidentified meat wrapped by noodle. Overall the dish had a nice flavor, but the lobster was overcooked and flavorless. My dining companion was hard pressed to even identify the filling as lobster. Apparently this is an artisan goat cheese produced by Soyoung Scanlan of Andante Dairy. Each of their cheeses is named after a musical term, reflecting her love of music. I was truly impressed with this cheese, firm an fairly mild with a nutty sharpness. 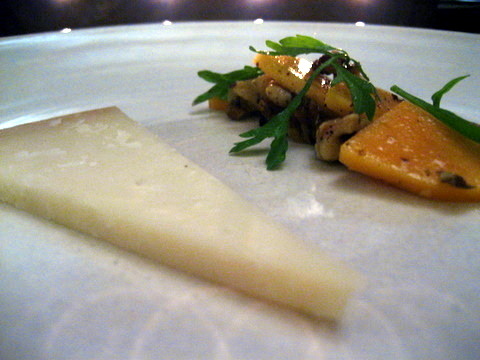 the use of fuyu persimmon added a lively crunch and hint of sweetness and the black walnuts added a toasted nuttiness to compliment the cheese. 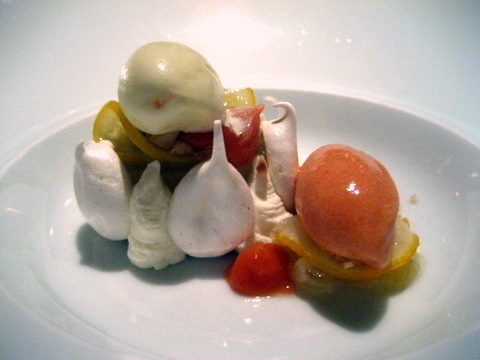 The dish had an intense fragrance of fresh fruit and flower. On the palate it was intensely acidic almost mouth-puckeringly tart, just what I want from a palate cleanser. 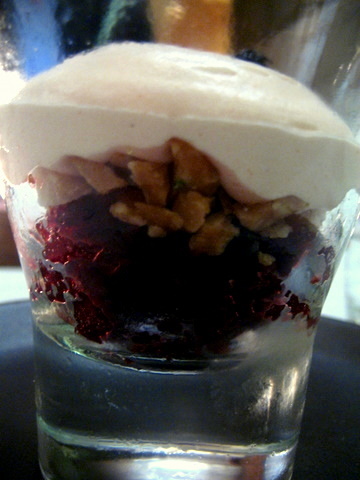 The parfait by itself was fairly good, a medley of sweet and sour fruits, but what really made this was the sugary sweet and crispy walnut praline. 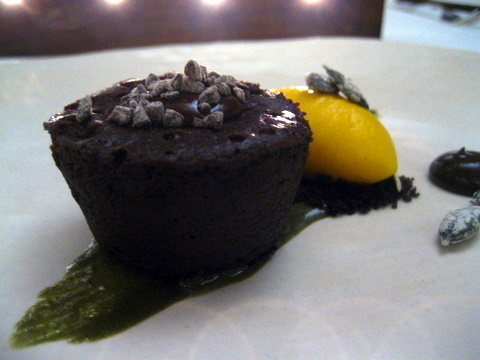 A fairly simple chocolate cake and a balanced sherbet, not too sweet but smooth and creamy. I really liked the cake with its its soft warm texture with a bit of sugary grittiness. The woody pepitas added a nice crunch that complimented the cake and the slightly sweet sherbet. This is one of those rare dishes where each part is delicious and the combination is even better. A wonderful last course to a transcendent tasting menu. 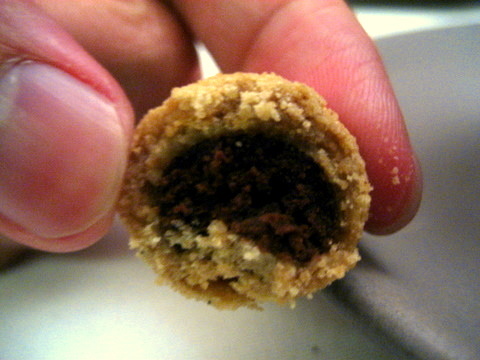 They called this a truffle but it was more like a cookie than a truffle. The morsel tasted a lot like a gob of raw cookie dough and if we mixed that with the next course would have been very much like chocolate chip cookie dough ice cream. Very tasty, as the name suggests this tasted like a rich vanilla milkshake with a slight grassy twist from the olive oil. 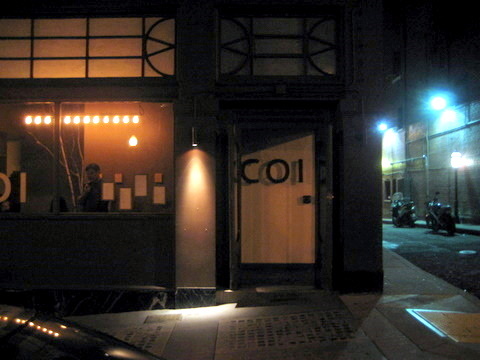 Coi was the meal I wanted out of Bazaar, innovative and exciting without sacrificing flavor. The ingredients in each dish worked in harmony to provide an exquisite flavor. 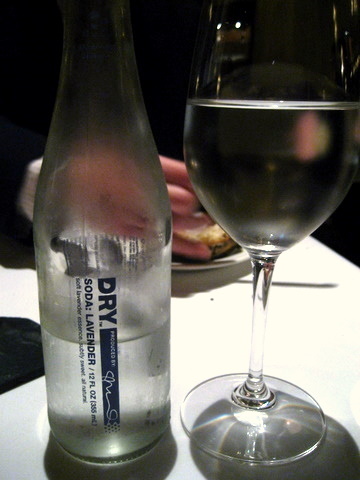 In fact many of the ingredients I complained about at Aqua were used here to great effect. 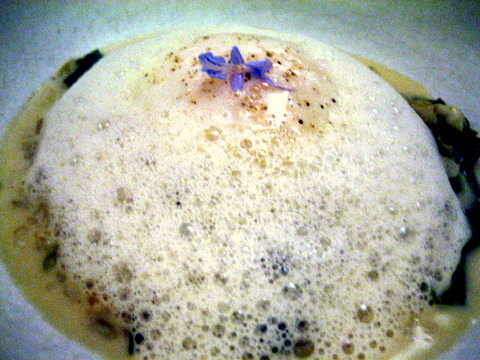 It has been quite a while since almost every course in a tasting menu has impressed me, but Coi did just that. The only misses were the supplements we ordered from the bar menu, but these were supposed to be more comfort food than fine dining. There is a definite focus on using the freshest ingredients and course change on a daily basis depending what the chef finds at the farmer's market. That the kitchen can produce such a sophisticated and well-designed menu with an ever shifting set of ingredients is doubly impressive. Our waiter told us, between consecutive days anywhere from 0-2 courses will change and within a few weeks the entire menu will be new. I will definitely make a point to come back next time in am in San Francisco. I almost wish I could wipe this meal from my memory so I can be just as amazed next time.